The team known as the Southwest Sentinels were in trouble. Chokepoint had blindsided them in their headquarters in Fort Adamant. It was a rough fight. The fact that the heroes were getting no military support in this fight, and that no alarms had been set off by Chokepoint’s entirely unstealthy arrival was not immediately concerning to them, but the Southwest Sentinels began to realize things were not quite what they had assumed. They fled through the military installation, narrowly dodging the attacks from Chokepoint. As they entered the lower levels, Chokepoint tore through a wall before them, and then was incapacitated by a blast of power. The wall she had just destroyed housed a secret room the heroes had never seen before. In that room were four large glowing crystals, each radiating a different spectrum of energy. Behind them, Chokepoint groaned and began struggling to her feet. She would be back at full power in no time - the heroes had a choice to make. And they choose survival. Now, Doctor Medico, Mainstay, The Idealist, and Writhe harness the power of Oblivion Shards and fight against the end of all things. They hold back the Void when no one else can. 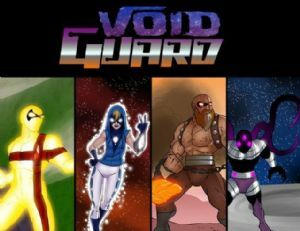 Sentinels of the Multiverse: Void Guard is a box set of four hero characters, complete with their own hero character cards and decks. A 27 card mini-expansion to Sentinels of the Multiverse featuring a brand-new villain, Ambuscade! BENCHMARK is the new standard! A hero built by the company REVOCORP, here to save the day! A mini-expansion for Sentinels of the Multiverse. Co-operative card driven comic super hero action - now back in a bigger better edition. Guise is a new standalone hero for the Sentinels of the Multiverse, with forty cards to play against the villains. ​A 27 card mini-expansion to Sentinels of the Multiverse featuring a brand-new villain, Miss Information! A mini-expansion for Sentinels of the Multiverse, with 15 cards that add a new place for the Heroes to do battle in. ​This double expansion combines Rook City and Infernal Relics, the first two expansions to the Sentinels of the Multiverse card game, in a single box. Sentinels of the Multiverse expansions Shattered Timelines and Wrath of the Cosmos boxed together. This was printed first for Everything Ever+ backers of the Sentinels of the Multiverse: Oblivaeon kickstarter. Stuntman was formerly the fearsome hero hunter, AMBUSCADE! Now, he returns as an action hero! ​A 15 card mini-expansion to Sentinels of the Multiverse featuring a brand-new environment, The Final Wasteland! A 41 card mini-expansion to Sentinels of the Multiverse featuring a brand-new hero, The Scholar! A 15 card mini-expansion to Sentinels of the Multiverse featuring a brand-new environment, Silver Gulch! ​A 41 card mini-expansion to Sentinels of the Multiverse featuring a brand-new hero, Unity! It's time for Baron Blade to hit back, he has 5 new allies each with their own reasons for hating the Sentinels, and each hell bent on defeating them! Villains of the Multiverse is a collection of ten super-powered villains for Sentinels of the Multiverse, and rather than being standalone villains, they work as part of a team of villains in the play style introduced in Sentinels of the Multiverse: Vengeance to group villains together as a team fighting against the hero team. Additionally,Villains of the Multiverse includes four new environments that can be used in any Sentinels of the Multiverse game. Before time there was a wager, the wager was lost but Wager Master was born, another villain to go up against the Sentinels. Introducing, the Sentinels of the Multiverse Ultimate Collector's Case! Decorated with beautiful art and elegant design, the interior of the case features trays in the top for tokens, rulebooks, and more, and drawers for oversized cards, hero character cards and variants, villain decks, hero decks, and environment decks.